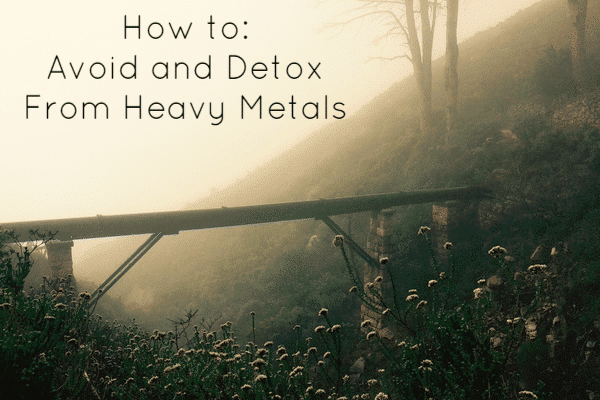 You probably know that heavy metals are bad for you. The research out there about the effects of heavy metals on the body is astounding. The most common heavy metal contaminants can cause harm to every single part of your body. We’re surrounded by these metals all the time—we’re putting them into the air, our drinking water, and our food. So let’s talk about it. How do Heavy Metals Get into Our Bodies? We have been polluting the air on a grand scale since the beginning of the industrial revolution. You can smell it when you’re on the expressway and driving around your city; the cars on the road and planes in the air are part of it. Those aren’t cloud factories you drive past either—those factories’ chimneys are shoveling contaminates into the air at an alarming rate. You’re breathing in the heavy metals all the time— airborne pollutants travel far and wide. Then the heavy metal particles in the air settle onto our soil, our food, and into our water supply (have you noticed a fine grit on your car after a short rain?). Aside from what settles into our water from the air, we’re also dealing with things like natural erosion, industrial waste, and old plumbing here. Heavy metals are naturally occurring elements and can erode as water passes over them in a well. This sort of contamination is typically not the most dangerous, but it’s still good to know what sort of bedrock you have in your water table. Industrial waste is very problematic in the water world. Construction, mining, and electronic waste release large amounts of heavy metals into groundwater sources. Herbicides, pesticides, fungicides, and insecticides all contain heavy metals and the runoff from farmers that use them can contaminate the groundwater. Do you live in a house with old pipes? You might want to check your tap water for heavy metals (especially lead). This is the most common way that heavy metals sneak into your tap water, because our pipes are made from heavy metals. As the pipes get old—maybe they rust, or just erode with continual water flow—they release toxic metals into the water as it travels through them. Heavy metals can get into our food a ton of different ways. Air pollution settles directly onto crops, and food that is grown in heavy metal-contaminated soil and/or irrigated with contaminated water will be higher in heavy metal contaminates. Do keep in mind though that these metals are, by definition, heavy. So plants don’t easily take them up through their roots. Soil has to be very contaminated for plants to become dangerous to eat. The greater danger is for those working in the soil and inhaling the metals. Meat can also be affected, because our bodies store a lot of heavy metals in our fat cells. Animals that have been fed and/or watered with contaminated food and water have these metals in them too. Commonly found in – Store-bought deodorant, pre-packaged foods, baking powder, antacids, canned food, buffered aspirin, city water, cookware, cosmetics, foil, processed cheese, vaccines, the air and water runoff from industrial and ore-smelting plants. Significant health effects – Studies show a correlation between high amounts of aluminum and neurological diseases like Alzheimer’s and Parkinson’s, renal failure, intestinal distress, and bone density loss. Commonly found in – Air and water runoff from chemical processing plants and ore-smelting plants, cigarette smoke, groundwater, fungicides/pesticides/herbicides, meat and seafood, preservatives, electronic waste, rice – especially brown rice and brown rice syrup. Significant health effects – Builds in the fat cells over time. Causes cancers of the skin, liver, bladder, and lungs as well as nervous disorders with a decrease in motor function and gastrointestinal distress. Commonly found in – Air pollution from mining and smelting plants, batteries, ceramic glazes, cigarette smoke, tap and well water, paint, electronic waste. Significant health effects – Primarily affects the lungs and kidney function, causes heart disease, anemia, autoimmune thyroid disease, and decreases bone density. Commonly found in – Air pollution, auto exhaust, batteries, electronic waste, insecticides/pesticides, soil (usually from fertilizers, pesticides, and insecticides), water (old lead pipes are the most common contaminate), cosmetics, hair dye, solder. Lead contamination is most common in places with rapid economic growth. Significant health effects – Well known to be a neurotoxin that targets the nervous system, brain, kidneys, heart, and blood. It decreases intelligence and affects bone density. Lead is stored in the fat cells and continually releases free radicals into the body. Significant health effects – Most notably affects the central nervous system, causing hallucinations and suicidal tendencies in the short term. Studies show that it may contribute to autism and multiple sclerosis. Mercury is stored in the kidney, liver, blood, brain, and fatty tissues of the body. Significant health effects – Lowers blood potassium, causes cardiac arrhythmias, elevated blood pressure, respiratory failure, gastrointestinal distress, paralysis, muscle twitching and kidney damage. Long-term low level barium exposure is a potential contributor to neurological diseases. Eat organic – Since a lot of heavy metals are found in chemicals sprayed on crops, it’s a no-brainer. Those harmful chemicals exist to kill living things, they’ll kill you too in high enough doses. Filter your water – Even just a Brita Filter with activated charcoal does a pretty good job of pulling out heavy metals. While we’re on the topic of filtered water, drink it. A lot of it. Filter your air – Surround yourself with plants that filter the air, get an air purifier, and use a diffuser with essential oils like mint, lavender, and eucalyptus. Antioxidants, antioxidants, antioxidants – Heavy metals create free radicals in our bodies, which wreak havoc on our health. Antioxidants scavenge your body for those free radicals and bind to them to get them out of the body. Green tea, blue/red/purple berries, and dark green veggies are all high in antioxidants. Eat garlic everyday – It’s a miracle plant. It helps protect your body from all things anti-you, like viruses, bacterias, heavy metals, fungi, and vampires. Eat Cilantro (Coriandrum sativum) – Add a quarter cup of cilantro to your daily diet. Yum! I know! Studies show that the herb helps remove mercury, aluminum, and lead (and maybe more) from your body primarily through your urine, SO DRINK WATER. Take Chlorella – These single-celled freshwater algae are one of the most ancient life forms on our planet. They are also one of the most nutrient dense supplements that you can take for your overall health and they bind to various toxic chemicals in the body to help you detox heavy metals like mercury, arsenic, cadmium and lead. Drink horsetail (Equisetum spp) tea – Horsetail is a well documented and oft-studied heavy metal chelation herb. It is known to pull heavy metals from the earth and remineralize the soil, and it works much the same way in our bodies. It’s a great source of bioavailable silica and helps our body get rid of aluminum and other heavy metals. Adapt (Eat mushrooms) – This one might not seem like it’s necessary here, but it is. Mushrooms are the first organisms to return to sites that have been devastated by nuclear destruction and heavy metal contamination. It’s an unfortunate reality, but we live in a world that is finding it increasingly difficult to stay clear of heavy metals and other toxic ingredients; mushrooms are great for helping our bodies adapt to the world around us. Eating mushrooms not only gives you energy, it helps protect and build your immune system. A mushroom tincture is great to help too. Call your doctor and ask them what the contrast agent is. If it is gadolinium, I would not get it. There are many cases of people with healthy adrenals that retained gadolinium. I’m having trouble making up my mind about whether not to get the CT scan my doctor ordered because not only do I have concerns about the radiation I’ll be exposed to, I will be given contrast intravenously & along with one to drink. I saw a little information on the Macola site that wasn’t comforting to say the least. Does anybody know where else I could research my options or get more information about the contrasts & there related risks?